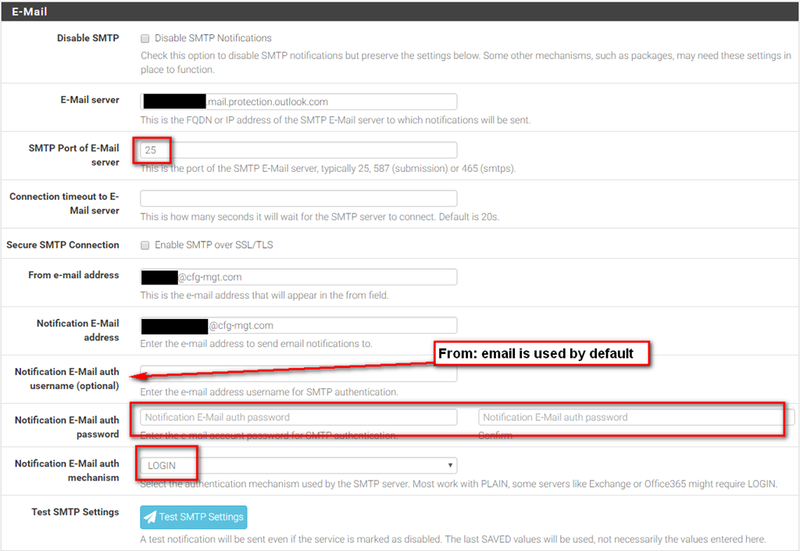 It’s always a challenge to get the SMTP settings correct for sending through Office 365 SMTP email. Here’s what I did for my new Netgate SG-3100. You can start at System | Advanced | Notifications. The important thing is to point to the email server than ends in mail.protection.outlook.com which is actually in your DNS MX record. What I normally do in Office 365 is create a single “service account” email and assign multiple aliases to it. Then I use the alias in the particular application, e.g. netgatedevice@mydomain.com. This alias also serves as the Notification E-mail Auth Username, which you can leave blank since you have it in the FROM address. This entry was posted on August 17, 2018 at 7:58 pm	and is filed under Computer Software, Networking. You can follow any responses to this entry through the RSS 2.0 feed. You can leave a response, or trackback from your own site.